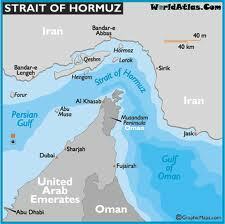 Iran threatened on Tuesday to stop the flow of oil through the Strait of Hormuz if foreign sanctions were imposed on its crude exports over its nuclear ambitions, a move that could trigger military conflict with economies dependent on Gulf oil. Western tensions with Iran have increased since a November 8 report by the U.N. nuclear watchdog saying Tehran appears to have worked on designing an atomic bomb and may still be pursuing research to that end. Iran strongly denies this and says it is developing nuclear energy for peaceful purposes. Iran's warning on Tuesday came three weeks after EU foreign ministers decided to tighten sanctions over the U.N. watchdog report and laid out plans for a possible embargo of oil from the world's No. 5 crude exporter.